Our lives are super busy. For me, I have deadlines, church, ball games for nieces and nephews, appointments for my mother-in-love, etc. I would love to tell you that I ALWAYS have these beautiful, made-from-scratch, meals on the table every night, but the reality is...I don't. However, easy meals do not mean you have to skimp on flavor and "panache" as they like to say. When you are pressed for time, using great ingredients can make all the difference. Today's recipe (if you can really call it that) is inspired by a great little artisan bakery I encountered on my food adventure to Columbus, OH a couple weeks ago. I know I have endlessly been talking about my two days spent at North Market, but I am not kidding when I say I have never been so inspired by ingredients in all of my life! One such place that inspired me, tucked away in the corner of the market, is probably one of the most beautiful bakeries I have ever encountered in my entire life! She is the owner of Omega and in just a few minutes talking with her, I knew she was the real deal! Her passion for bread made the right way in INFECTIOUS and you can SEE it in everything she brings to the table. She prides herself on making bread the way it should be made, the European way, with no additives. What I love about this bakery is that it is artisan, that means they make breads in small batches, so they can control the quality of each loaf. That way we are guaranteed to get the best possible product on our tables. Along with her fantastic artisan loaves, she also offers an array of chocolate delights all handmade and decorated. *sigh*...One more look shall we! I personally was so excited because on my trip there, she was experimenting with three of my favorite things. Bread, Bacon, and Cheese. The minute I tried the "special of the day", I knew I had to purchase a loaf and make a delicious Panini with it! 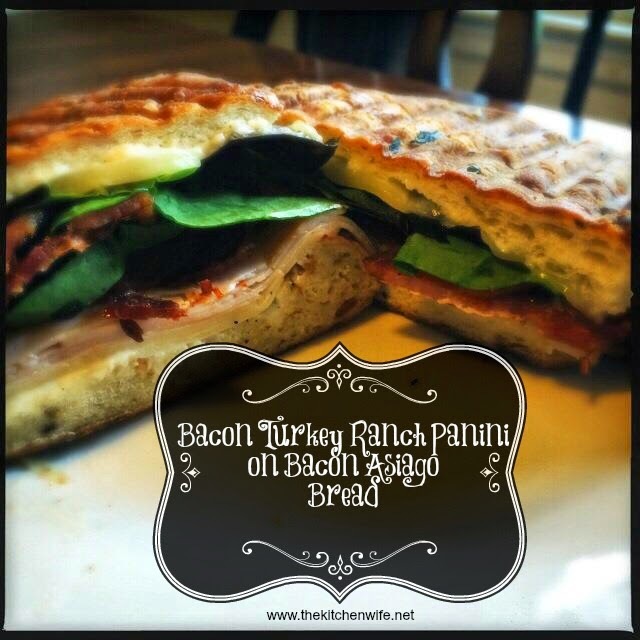 So here it is, a dinner worthy sandwich that WILL not disappoint on flavor! I know that, traditionally, you would fry your bacon in a skillet, but when you are pressed for time, you don't want to mess with all of that, NOR do you want the mess in general. A great alternative is to oven fry your bacon. PERFECT every time and no mess! Now to prep the bread. This is the beautiful loaf that I purchased at Omega. The bread itself is packed full of actual bacon and asiago cheese. Then, as if that was not enough, just as it comes out of the oven, they brush it with bacon grease. then cut eat half in half. Since this is a very thick loaf of bread, you will need to pull out the "meaty" part. Now you will want to spread your ranch dressing on both sides of the bread. Add AT LEAST 2 slices of cheese to each side of the bread. Then, on one side of the bread, add the turkey. On the other side, add the spring greens. WAIT! STOP! Don't eat it yet! I mean, you COULD, but I PROMISE you, things are about to get better. and place the sandwich on it, top-side down. In my case, I am using a grill pan. If I was making this in said skillet, I would wrap a brick in foil and use that. Allow it to cook for 2-3 minutes, flip, and repeat. And there you have it! A delicious, flavorful, and filling Panini! I cut each half of the loaf onto an angle which provided 4 MAN-SIZED sandwiches. Serve with your favorite chips, some crisp fruits slices, or carrot sticks. I promise you, you may never go to a certain specialty sandwich shop again! Thank you so much Omega Artisan Baking for your beautiful bread and the inspiration for this meal! I will be back SOON for seconds! And if you are anywhere near the Columbus, OH area North Market and Omega Artisan Baking should be at the TOP of your places to visit. Place bacon on the baking sheet, and put in oven for 15-20 minutes. Pull the meaty part of the bread out, and save for a later use. Smear ranch dressing on both sides of bread. Place 2 slices of cheese on both sides of bread. On one side of the bread add the turkey. On the other side of bread, add the spring greens. On the side of the bread with the turkey, add the bacon. Place both sides of the sandwich together. Heat a grill pan, or whatever source for grilling you choose. Place a heavy skillet on time. Serve with side of your choice.